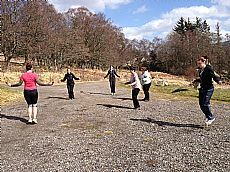 When you visit www.scottishbootcamp.com (“our web site”) you may be asked to provide certain information about yourself including your name, contact details and other information given by you when filling in forms on our site. This includes information given by you when you register to use our site or make a booking. We may also collect information about your usage of our web site (including but not limited to traffic data, location data, weblogs and other communication data whether this is required for our own billing purposes or otherwise) as well as data about you from messages you post to our web site, letters and emails you send to us or information gathered during our telephone conversations with you (including financial and medical related). We may ask you to complete surveys that we use for research purposes although you will be under no obligation to respond. We may collect and process details of transactions you carry through on our web site and of the fulfilment of your bookings. We may collect information about your computer including, where available, your IP address, operating system and browser type for system administration and to report aggregate information to our advertisers. This though is statistical data about our users' browsing patterns and does not disclose identities. For the same reasons we may collect information about your internet usage by using a cookie file. Cookies are small files of information which are stored on your computer. Web sites you visit ask your computer to store this information and retrieve the information from your computer so that they can keep track of things like other websites you visit or how you navigate our website or other files which provide you with our website. Cookies also allow us to, for example, monitor website traffic, store information about your preferences and so allow us to customise our website according to your individual interests, speed up your searches and also recognise you when you return to our site. Most browsers accept cookies automatically but usually you are able to alter the settings of your browser to prevent automatic acceptance. Any personal information which you submit will be retained by us for as long as you use our web site including (but not limited to) any facilities, tools, services or information and any online communications infrastructure (to include email, message boards, live chat facilities and email links) that we make available, at any time, through our web site. Any financial data that you submit will not be stored or recorded. We use information held about you to improve our products and services and to provide you with information on products or services that you request from us or which we feel may be of interest to you. Information held by us is also used for the purposes of internal record keeping, to enable us to carry out our obligations arising from any contracts entered into between you and us, to notify you about changes to our services and to make contact with you for market research purposes. We may employ, from time to time, the services of other parties for dealing with matters that may include, but shall not be limited to, payment handling, search engine facilities, advertising and marketing. The providers of such services do have access to certain personal data provided by users of our web site. We may also pass aggregate information on the usage of our web site to third parties but this will not include information that can be used to identify you. Where you have consented when providing us with your details we may also allow carefully selected third parties to contact you occasionally about products and services which may be of interest to you. They may contact you by post, telephone, fax or email. If you change your mind about being contacted by these companies in the future please let us know. If our business enters into a joint venture with or is sold to or merged with another business entity your information may be disclosed to our new business partners or owners. Unless otherwise required, or permitted, to so by law or to enforce or apply our terms and conditions of business and other agreements or to protect the rights, property or safety of Scots Boot Camp Ltd trading as Scottish Boot Camp (including exchanging information with other companies and organisations for the purposes of fraud protection and credit risk reduction) we shall not share, sell or distribute any of the information you provide to us without your consent. You are entitled to see the information held about you and you may ask us to make any necessary changes to ensure that it is accurate and kept up to date. If you wish to do us please contact us as we are the data controller for this information. We are entitled by law to charge a fee of £10 to meet our costs in providing you with details of the information that we hold about you. You have the right to ask us not to process your personal data for marketing purposes and whenever you submit data you will be given options to restrict our use of that data. You may access your account at any time to amend or view the data. If your circumstances change you may need to update and modify your data. Additional data as to your marketing preferences may be stored and you may change this at any time. Our web site may, from time to time, contain links to and from the websites of our partner networks, advertisers and affiliates. If you follow a link to any of these websites, please note that these websites have their own privacy policies and that we do not accept any responsibility or liability for these policies. Please check these policies before you submit any personal data to these websites. We are committed to protecting your privacy and have in place strict security procedures covering the storage and disclosure of your information in order to prevent unauthorised access and to comply with the Data Protection Act 1988. This means that sometimes we ask for proof of identity before disclosing any personal information to you.